Active participant in the national liberation movement; a popular public figure. Deputy Attorney of Plovdiv after the Liberation of 1878. 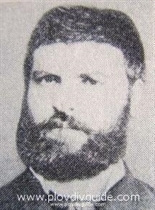 One of the founders and leaders of the secret committees called Unity, that fought in favor of cancellation of the Berlin Treaty (1878) cutting Bulgarian into two parts. As a member and Secretary of the BG Secret Central Revolutionary Committee (BSCRC), he actively participated and took part in the very act of the Unification (1885). MP in several consecutive nattional Assemblies.